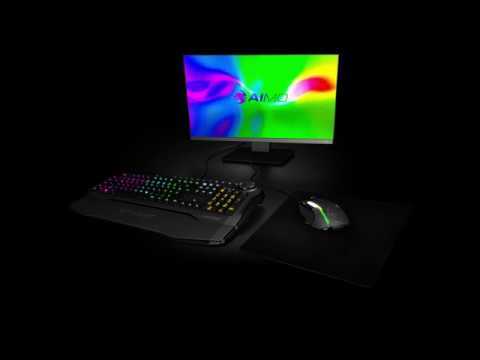 In the past, RGB lighting has suffered from limited functionality, variety and connectedness; blinking, flashing, distracting lighting that differs little between when a player is idle or gaming. AIMO* reaches beyond this – it is intelligent, organic, and evolving. What we call Living Light. AIMO-enhanced gaming peripherals are built around a learning lighting experience, adapting to your play the more you use them, and becoming more dynamic and nuanced as AIMO products combine. AIMO compliments the owner’s needs intuitively, dazzling when desired and taking a backseat when gamers do what they do best. Game. We started the RGB revolution, now we’re making history again. This is the new generation of RGB, and it starts now with our first three AIMO-enhanced products, the ROCCAT Kone AIMO gaming mouse, the ROCCAT Horde AIMO gaming keyboard and the ROCCAT Khan AIMO-7.1 Surround Sound Gaming Headset. These are just the first of a series of AIMO products to come. Step into the light with AIMO.